Exchange 2010 implements a change to managing security distribution lists, especially in SP1. When using the Exchange Management Console (EMC) in the RTM version, changes made to membership or ownership of a security distribution list are successful when you are not the owner. This is because a parameter of the Set-DistributionGroup cmdlet is tacitly added that allows someone with the RBAC management role of Security Group Creation and Membership to update the DL. Starting with Exchange 2010 SP1, the console no longer adds this parameter (-BypassSecurityGroupManagerCheck). The result is that, despite being an administrator (by being in the Organization Management role), if you are not explicitly listed as an owner of a security DL, you will not be able to makes changes to ownership or members via the console…period. This goes against the functionality that has existed in the Exchange console since 1996. And better yet, Microsoft says this is by design. The fact that it worked in RTM is the bug, not the other way around in SP1. I think that is one of the most boneheaded changes made in 2010. The solution is to either add the administrators as explicit owners or have them use the shell and manually add -BypassSecurityGroupManagerCheck. Both options are impractical. If your help desk manages DLs you can’t just add all members as owners. For one thing, even though Exchange 2010 supports multiple owners, Outlook (even 2010) only displays the first entry. This means end users won’t know who to contact because the listed owners could be one or two “real” owners and all the rest are help desk. The other option, using the shell, isn’t the easiest for anyone that isn’t a dedicated Exchange admin. My solution for the help desk staff is a PowerShell script that uses Windows forms to provide a GUI that lets you search for a DL, display the ownership, add and remove owners, then apply the changes. It includes username validation so it won’t let you add a user that isn’t mailbox-enabled. The one place I struggled is connecting to Exchange. The script checks for the Exchange cmdlets being in memory. If they are not, it will connect remotely to a designated server. Because that is done when the form is activated, it causes the painting of the fields and labels to be delayed until the connection is complete. I tried to find a way to wait until the painting is complete before connecting, but you can’t detect that when the fields are drawn by Windows directly and not the application. $form.Text = "Change Distribution List Owner"
$label6.Text = "Add and remove owners as necessary, then click Apply Changes to update the DL's ownership." 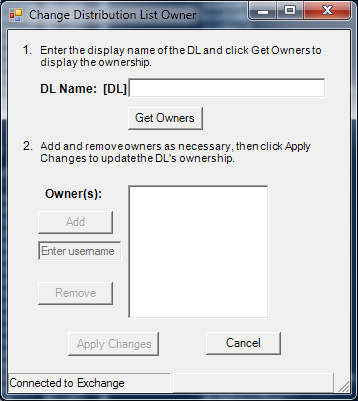 $label1.Text = "Enter the display name of the DL and click Get Owners to display the ownership." $label4.Text = "DL Name: $DLPrefix"
$statusBarPanel1.Text = "Connecting to Exchange..."
$txtOwnersTip = "Enter the username of someone to be added as an owner." $txtDLNameTip = "The display name of the DL as it appears in the address book." This entry was posted in Exchange 2010, PowerShell and tagged inline code by Scott. Bookmark the permalink.